AGAINST STATES, CAPITAL, NATIONALISM AND WAR! 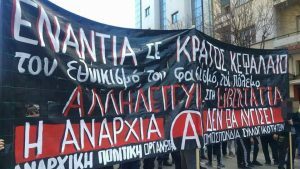 Our comrades in Greece, APO-IFA (Αναρχική Πολιτική Οργάνωση – Ομοσπονδία Συλλογικοτήτων), member organisation of the International of Anarchist Federations , formed a 300 strong bloc at the internationalist-antifascist pan-Balkan demonstration against nationalism, capital, fascism and war and in solidarity with Libertatia squat. 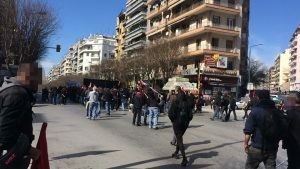 The protest was called by anarchist/anti-authoritarian groups and organizations as an answer to nationalist mobilizations (concerning Macedonia) in January and February during which social center Libertatia in Thessaloniki was burned down by fascists. More then 4000 people attended the demo with comrades from many Balkan countries present. More activities are to follow. FOR BALKANS OF SOLIDARITY AND STRUGGLE! NO FASCIST ATTACK WILL REMAIN UNANSWERED!